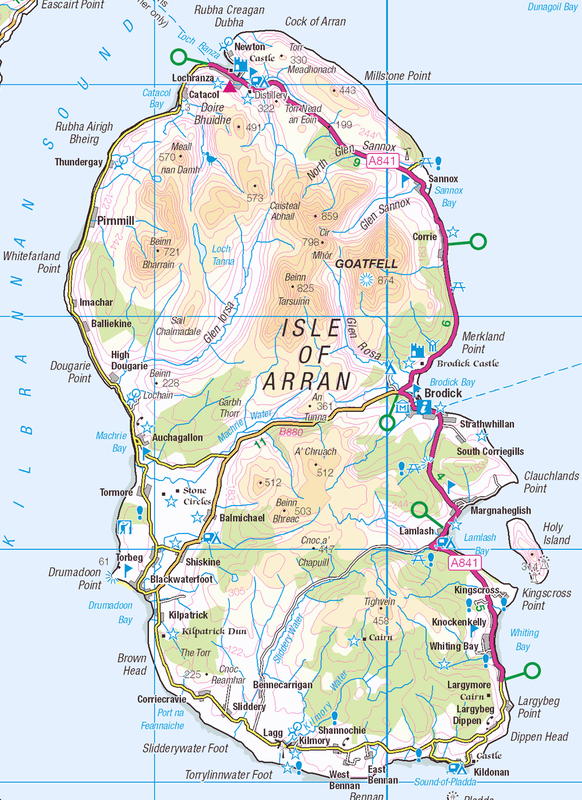 It was time to saddle up the bikes and head for the Isle of Islay via the Isle of Arran. We headed to the Ardrossan early to catch the Calmac to Brodick. It was certainly alot cheaper than a car to go across the water! Excited at the prospect of just leaving the car and having 2 wheels and a small amount of kit was liberating when life is governed usually by timetables and deadlines! The weather forecast for the next few days was a little mixed but we were looking forward to getting on the open road! The ferry ride is soon over and we could see Goat Fell as we approached Brodick. Once off the boat we headed towards Lamlash Bay. The weather was starting to turn and it was time for raincoats! However this did not deter us from the stunning scenery and great riding. Once we had finished admiring the view over to Holy Island we headed towards Kildonan admiring the view out to Ailsa Craig and the lighthouse on the small island of Pladda. The riding is undulating but the roads are fairly quiet and there is always a good view to keep you interested as it changes around every corner. It was soon time for lunch and a stop at Blackwaterfoot and the Kinloch Hotel. Having burnt a few calories we were stocked up! The next stop would be Lochranza and the Apple Lodge B&B which would be home for the night. Riding on the newly laid tarmac was quite a relief and made the riding alot more easier! Although towards Lochranza the roads do flatten. Checking the directions to the B&B and admiring the view at Lochranza allowed us time to reflect on the great days cycling that we had. It also allowed us to get our bearings ready for tomorrow catching the ferry to Islay. The B&B was lovely and the people very accommodating towards us and our bikes. We had been given the annex on the side of the house which gave us a self contained area to sleep and chill for the night. Evening meal was to be had in the Lochranza hotel which was friendly and a lovely walk from the lodge. A lovely meal in the Lochranza Hotel was just what the doctor ordered after a great days cycling. We headed back to the B&B admiring once again the stunning view. 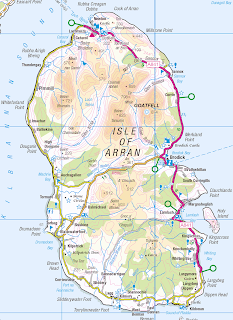 We went over the route for tomorrow which consisted of two ferries and would see us landing on Islay. Leaving the B&B in the morning was not the most pleasant experience as the midges decided to have their breakfast on 3 riders from Cumbria! We soon shifted along the road relieved not to be followed! The ferry port was 1 minute down the road so we were not worried about making the ferry. The morning was stunningly calm and we had time to admire once again the fantastic view. Excited once again about embarking the ferry with our bikes we were soon settled sailing back to the main land to land at Claonaig. The route meant we had to ride the width of the mainland to meet the sea the other side at Kennacraig. We climbed over the top taking in the great view in all directions. It was then freewheeling to the ferry port at Kennacraig. We arrived a little too early so decided to head down the road to find a cup of tea in true 'girls on tour' fashion! We eventually stopped at the West Loch Hotel. The staff were extremely friendly and welcoming and we even had homemade complimentary cookies!! Riding the A83 back was a scary experience! WARNING: If you see a B Mundell lorry beware! We saw 2 drivers in the space of half an hour and one purposely did not move out and went so close we thought he was going to hit us! The second we saw in the ferry port and he coupled his trailer up wrong then went off so fast it uncoupled and hit the ground, good job for air brake leads! This could have been a nasty accident! Unsafe and disgraceful behaviour from both drivers! Should not be on the road! Unfortunately they seem like the main haulage company on Islay so we were quite worried! We penned an email to the company to explain our concerns but in its true unprofessional capacity it didn't respond! Anyway putting that aside we were soon relaxing on the ferry to Islay sailing out of West Loch Tarbet. Our plan was to ride from Port Askaig to our B&B at Bruichladdich. However unbeknown to us Port Askaig was shut and we were heading for Port Ellen on the south side! Change of plan needed! When we arrived the weather was less than welcoming but at least we would be warm on the bikes! Coats on we were soon heading north to our luxury B&B for the night. Lightweight and luxury was the aim of the trip! The weather soon brightened in typical Scottish fashion! 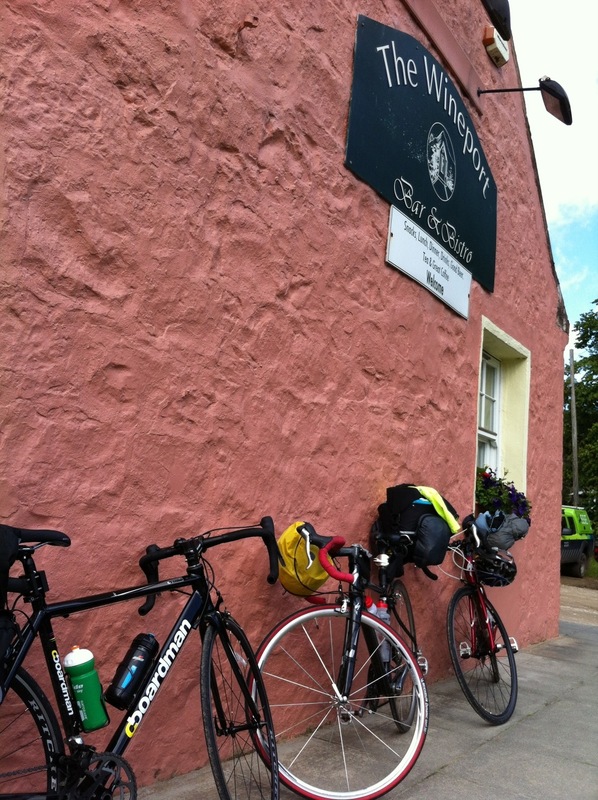 The cycling was flat and we were flying along to Loch Gorm House which was going to be home for the night! A mile before we arrived the heavens opened and we were soaked! I dread to think what the lady was thinking when we arrived looking like drowned rats to a 5 star B&B! When inside we were wowed by the place! A shower and change later we were treated with cakes and tea in the drawing room!! This was certainly the luxury bit!! After a chill we ordered an exciting (at times scary) taxi drive to Port Charlotte and the Port Charlotte Hotel for tea! 3 courses later we decided to walk the couple of miles back to the B&B discussing the days adventure! Due to the change in route the next day was going to be an early start! The B&B owner was so kind she offered us her car which could be left at the ferry port with the keys in it if we wanted to take it rather than ride the 20 miles in the morning! The majority vote was to ride so it was a dawn start back to the ferry! The weather was once again mixed but we were enjoying the tranquillity of the Scottish Isles! Soon we were back at Port Ellen waiting for the ferry! The Ferryman was a little disappointed that we had drunk tea and not whisky! The way back was going to be a bit of a jigsaw puzzle catching 3 ferries and riding 2 Islands and a mainland peninsula before arriving back at Ardrossan in time for tea! The first ferry was caught and we enjoyed the cruise back to Kennacraig! The ride back over to Claonaig is stunning, a good climb, great scenery and a downhill to finish! As you can see from the picture we just missed the earlier ferry but decided to ride along the coast a little to sample the scenery! There is not much around except stunning beaches and quiet roads! After our little explore it was time to board the ferry back to Lochranza before tackling the climb over the top to Sannox. The climb starts immediately out of Lochranza but is gentle and there is plenty to keep you mind occupied! Over the top we freewheeled down the glen enjoying the speed and view! The road had recently been maintained judging by the stunning tarmac! Along the Sannox road the sea keeps you company along with the steep sided mountains! Having walked in the area there were now familiar landmarks! One more tea stop before we arrived in Brodick to catch the ferry home! Sad to leave we had thoroughly enjoyed the magic of the Scottish Isles even though it had been a fleeting visit ! We all vowed to come back soon !